Agrigento has one of Sicily top sights—the amazingly preserved 5th century BC Greek Temples (and assorted other bits) in a large archaeological park called the ★★★ Valley of the Temples, a series of 5th-century BC Doric wonders surrounded by olive and almond trees just below the city on the long slope toward the nearby coast. 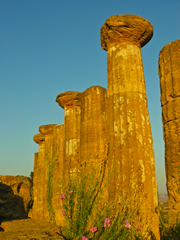 Ruins of the Temple of Zeus. (Photo by Clemensfranz) To the right of the road, past the ticket booth, are the massive, jumbled remains of the ★ Temple of Olympian Zeus, or Olympieion, the largest ancient Greek temple ever attempted. At 363 by 174 feet, this monster was begun in 480 BC but left unfinished when the Carthaginians invaded in 409. Had it been finished, it would have reigned as the largest Greek—or Roman—temple ever constructed. 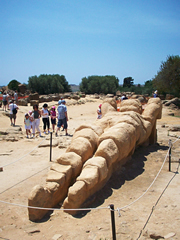 The giant telamon at the Temple of Zeus. (Photo by Søren Hugger Møller) Earthquakes and wars brought most of it down, and in the 18th century much of its stone was quarried to build the nearby port of Porto Empedocle. It's hard to fathom the sheer size of the thing—little remains other than a few weedy mounds of ancient cut rubble—but here are some ciphers to help. Each column was over 55 feet high and 13 feet thick at the base—there's half of one capital sitting near the top of the rubble pile. Lying in the dust nearby is a worn replica of one of the telamones, or columns carved as a man (the original is in the museum up the road). This 25-foot giant took up less than half the height of the columns (never mind adding in the steps, pediment, and roof). Beyond this is a pile of cut blocks with U-shaped grooves, which were used to help haul them into place. 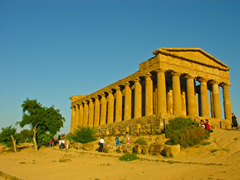 Temple of Heracles.We've saved the best for last, the postcard trio of temples up off the east/left side of Via dei Templi, balancing atop a wide ridge with a wash of olive groves spilling down on the Agrigento side, and a cliff falling off toward the sea on the other. 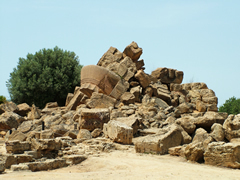 When you first clamber up into the area on some steps chipped out of the stone, you find yourself climbing into the ruins of the Temple of Heracles, the oldest shrine in the complex (500 BC). Most of it is tumbled down, but eight, 33-foot-high columns have been re-erected, and you can scramble about the remains of the cella. Tempio di Concordia (Temple of Concord). Just up the road, past a paleo-Christian necropolis with tombs honeycombed into the rocky ground and tunnels under the road, is the spectacular Temple of Concord. Raised in 430 BC, this is the best preserved Greek temple outside of Athens itself—largely because Agrigento's bishop turned it into a church in the AD 6th century. In the more classically minded 18th century, all the churchiness was stripped away. The cella and 34 Doric columns all still stand, supporting an architrave and miraculously complete entablatures on both ends. The temple's in such good shape, they've since fenced it off for preservation reasons. The Tempio di Hera (also known as the Tempio di Giugnone). (Photo by poudou99) The road continues to slope up, passing the remains of the ancient city walls on the right set with some Byzantine tombs, to the broken-toothed Temple of Hera, also incorrectly called the Tempio di Giugone, or Temple of Juno. It was built around 450 BC at the very edge of the cliff. Twenty-five of its 34 columns remain standing, with bits of the entablature intact on one end. At the time of writing, it was partially scaffolded, and remains temporarily closed to visitors for fear of another landslide at its edge like they had in 1976. A low, stepped wall on the far side makes (wind notwithstanding) an ideal spot to picnic with the panorama of temples before you. 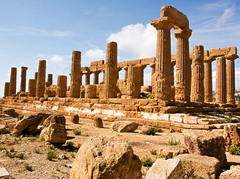 ★★★ Agrigento Area Archeologica "Valle dei Templi"
City buses 1, 1/, 2, 2/, 3, and 3/ run from in front of the train station down Via dei Templi into the Valley of the Temples. You can get off at the Museum/Insula Romana or stay on all the way to the Posto di Ristoro, a pricey cafe/souvenir stand at the entrances to the two temple zones. For a taxi, call tel. +39-0922-26-670 or 0922-21-899. A trip from town down to the temples should be about €15. If your time is limited, just hit the temples. There's nothing of consequence to see in the city itself.